Editors: Wolf, Shelby, Coats, Karen and Enciso, Patricia A. 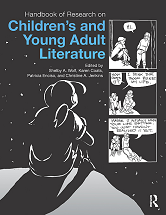 This landmark volume is the first to bring together leading scholarship on children's and young adult literature from three intersecting disciplines: Education, English, and Library and Information Science. Distinguished by its multidisciplinary approach, it describes and analyzes the different aspects of literary reading, texts, and contexts to illuminate how the book is transformed within and across different academic figurations of reading and interpreting children's literature.